PASADENA, Calif. — NASA's Curiosity Mars rover will live up to its name today (Aug. 7), poking its robotic "head" out to take a look around for the first time since landing on the Red Planet. Curiosity touched down late Sunday night inside Mars' huge Gale Crater (Aug. 5), pulling off an intricate and unprecedented sequence of maneuvers that ended with a rocket-powered sky crane lowering the 1-ton rover to the ground on cables. Curiosity and its management team have since begun the months-long series of checkouts and tests that will get the rover ready for its two-year surface mission, which aims to determine if the Gale crater area is, or ever was, capable of supporting microbial life. And today, on Sol 2, Curiosity will untuck its instrument-studded head, which is officially known as the Remote Sensing Mast (RSM). "The big thing on Sol 2 is the RSM deploy," said mission manager Mike Watkins, of NASA's Jet Propulsion Laboratory here. The mast hosts four navigation cameras, or navcams, and these should get their first workout today as well, Watkins added. "We start to use the RSM to take our first deck panorama using the navcams," he told SPACE.com. "So we do kind of the lower-tier, where you can see the rover deck, and then the middle tier. It's mostly of us, but you should see a little bit of the ground around us." These 360-degree black-and-white views should start coming down to Earth on Sol 3 and Sol 4, Watkins said. They won't be the first images from Curiosity; the rover has already beamed home Mars pictures its hazard-avoidance cameras took immediately after landing. The RSM also holds two high-resolution color "Mastcams" and an instrument called ChemCam, which will fire a laser at rocks and then determine their composition by analyzing the vaporized bits. The first navcam photos will stay close to the ground, to ensure ChemCam stays safe. "We're trying to be a little bit cautious with pointing ChemCam at the sun and stuff like that," Watkins said. Caution and patience are key in these early days, team members have stressed. The $2.5 billion Curiosity is the most complex and capable robotic explorer ever launched to another world, NASA officials say, and fully vetting the rover and its 10 science instruments is the first order of business on Mars. 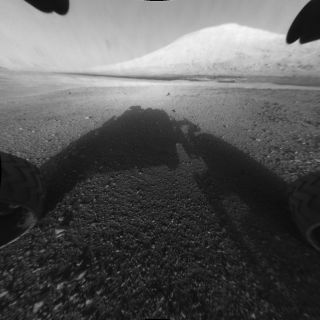 While the checkout process will likely take several months, Curiosity will be gathering data all the while. Another big milestone should come in a few weeks, when the rover moves its wheels for the first time, Watkins said. "I would say a couple of weeks is a good number for that," he said. "And it will be quite a short drive — you know, a meter or two or something."